Germania 46 1844-1850 (Ger-Fr-Eng). Eg., pg. 63. EL2. 2001.On loan from Germania Lodge No. 46, Inc. Jahresbericht of the Deutsche Gesellschaft 1847 (1st year). Deutsches Haus Collection, MSS 609, box 1, item 4. Becoming American at the beginning of the nineteenth century meant great increases in immigration and commerce for Louisiana. While always present to an extent, German immigration to the state boomed in the 1840s. By 1870, twenty percent of Louisiana’s population was German-speaking (Merrill, The Germans of Louisiana, from the introduction by Don Heinrich Tolzman). While most of the estimated 750,000 Germans who used New Orleans as a port of entry to the United States in the nineteenth century continued up the Mississippi to the Mid-West, or took the Red River to Texas, many did stay in the city and its surrounding areas. The German presence in the New Orleans population brought commerce. Antebellum New Orleans profited significantly from trade with Germanic royal duchies such as Bavaria, Bremen, Hamburg, Hannover, Prussia, and Nassau, many of which had consulates in the city. Numerous records and correspondence of some of these consulates are preserved in the Deutsches Haus Archives and the German Study File at THNOC. These documents offer insight into the breadth of trade activity and ship traffic between New Orleans and German lands, as well as into the activities of German citizens of New Orleans who were counted amongst the city’s most prominent figures. An interesting example from the German Study File is found in 10 items that document the occasion in 1848 when the City of Lafayette (later annexed by New Orleans) made a gift of a German flag to the Duchy of Bremen, in honor of their lucrative economic partnership. 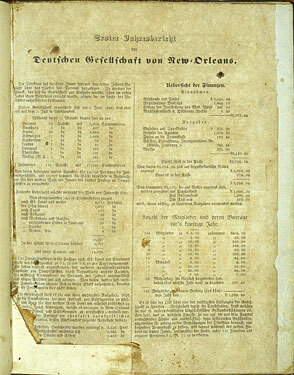 The impressive pomp and circumstance surrounding this gift, performed by both the givers and the receivers, clearly illustrates the importance of German trade to New Orleans in the first half of the nineteenth century, while also pointedly showing that it was German New Orleanians themselves who were responsible for its development. These Germans played an influential and positive role in the growing economy of the entire city. Above all else, though, they saw themselves as members of their own community, the general well-being of which was their most important priority. This is evidenced, in part, by the creation of numerous German benevolent organizations to serve the purpose of supporting the German community itself. While such groups became more plentiful later in the nineteenth century, some had their beginnings well before the Civil War. Die Deutsche Gesellschaft (The German Society) was founded at the end of 1847 to help protect newly arrived German immigrants from the less than noble advice or offers they may otherwise have entertained upon arrival in the Port of New Orleans. The society furnished the indigent with assistance (provided they were willing to work), and all other German newcomers with whatever assistance they needed to settle in New Orleans, or to move on to other points. Other early German benevolent organizations were the Deutscher Verein im 2. Distrikt (2nd District German Club), dating back to 1856, and the Germania Lodge 46 of the Free Masons, the records for which THNOC has from as early as 1844. Interestingly, the first records of the Germania Lodge were trilingual, copied in German, French, and English. This is the case, however, for only one year’s worth of material. Thereafter, the club functioned exclusively in German through the first quarter of the twentieth century. Unfortunately, there were again, as usual, an un-ignorable number of bums and deadbeats among the foreigners we’ve mentioned above. They wandered around the city and the region, purportedly looking for work, and pestered our citizens—often in a most fresh and refined manner—especially the clergy, and various consuls, doctors, businesspeople, the German Newspaper, etc. One must never give one single donation to such wandering tramps, who avoid all work like the plague. One encourages the vice by doing so. 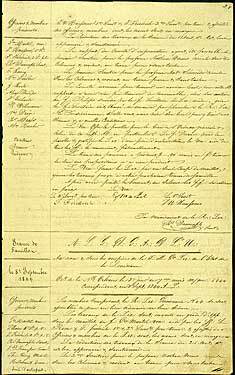 Together with this admonition, we should also mention that there exists an organization in Munich, Bavaria, with multiple branches, whose purpose, among other things, is to collect funds with which to send to America a portion of their penitentiary inhabitants and good-for-nothing subjects in order that they can be rid of them. Two such cases have recently come to our personal attention. Of course, part of the reason why this excerpt is humorous in our eyes is that such cases were most certainly the exception to the rule. Most of the Germans who arrived in New Orleans requiring assistance were eager to work and went on to become self-supporting. In THNOC’s materials, the rising numbers of members in the charitable organizations versus the dwindling number of aid recipients evidences this, as do the exploding numbers of German-owned businesses, most of which belonged to the same people found in the membership logs. While the German organizations of New Orleans never abandoned their benevolent work, it became, over time, more and more a function of their social activities. In 1927, perhaps due in part to this development, two of the city’s larger German clubs, the Turn-Verein (Turner’s Society, an athletic organization) and the Harugari Männerchor (a singing society, see section 4 of this pathfinder), merged together into one organization and purchased a property to become their clubhouse on the corner of Galvez and Cleveland Streets. The Deutsches Haus, as both the building and the new organization were called, became the meetinghouse for most of the city’s German organizations, including the Deutsche Gesellschaft and other benevolent organizations. Originally, some clubs continued to hold their own separate meetings in the new clubhouse, but inevitably, the communal setting led to the merging of all the groups involved into one, amalgamated Deutsches Haus. Today, the Deutsches Haus is still active. The organization constructed a new clubhouse on Bayou St. John in Mid-City in 2018. Correspondence, legal documents, deeds, and records concerning the formation of the Deutsches Haus are found in the papers of attorney Leon S. Cahn (84-12-L), who orchestrated the merger. German immigrants quickly established themselves as independent citizens in New Orleans, and as immigration numbers declined after 1870, the city’s Germans looked less like a group of newly arrived immigrants and more like an established community of locals. The minute books and treasurer’s receipt books of organizations such as The Germania 46 Lodge, The Deutsche Gesellschaft, the Deutsche Männer Unterstützungsverein, and the Deutsches Haus and its composite organizations all contain loose receipts and correspondence written on the art-nouveau letterhead of multiple German-owned printer shops, breweries, music stores, restaurants, and metalworks, to name a few. These materials quite thoroughly document the years from two decades before the Civil War until the years leading up to the Second World War. There are also sporadic books from a couple of institutions that range in date from the 1950s to the present. These minutes, receipts, advertisements, flyers, announcements, and invitations clearly convey the size of the support system New Orleans’s German community set up for itself. They also lend insight into the business and social activities of individual members of the German community—both the well-known and the otherwise anonymous. Archive of Germania Lodge No. 46. EL2.2001. 174 items. Minute books, receipt books, guest books, membership records, treasurer’s and secretary’s reports, books from the lodge library, and other ephemera of the Germania Lode No. 46, Free and Accepted Masons. Earliest record in collection is from 1844, latest from 1973. Included in collection are also books from the Friends of Harmony Lodge. Deutsches Haus Collection. MSS 609. Ca. 90 linear feet. The archive of the Deutsches Haus organization, including materials from preexisting groups that aligned themselves to form the Deutsches Haus. These organizations include Die deutsche Gesellschaft von New Orleans (The German Society of New Orleans), Deutscher Verein im 2. Distrikt (The German Club of the 2nd District), Der Turn-Verein (Turners’ or Gymnasts’ Society), Das deutsche protestantische Waisenhaus zu New Orleans (The German Protestant Orphanage of New Orleans), Das deutsche protestantische Heim für Alte und Gebrechliche (The German Protestant Home for the Aged and Infirm), Der deutsche Protestantische Bethanien-Verein (The German Protestant Bethany Society), Das deutsche Ev.-Luth. Bethlehem-Waisenhaus (The German Evangelical Lutheran Bethlehem Orphanage), and the Deutsch-Amerikanischer National Bund – Staatsverband für Louisiana, (The German American National Bund – Louisiana State Chapter). This collection also includes 400 volumes from the organization’s lending library, as well as the Deutsches Haus Musik Archiv. Deutsche Männer Unterstützungsverein. EL27.1988. Includes nine volumes of administrative materials from the Deutsche Männer Unterstützungs Verein (German Men’s Benevolent Organization). The DMUV is one of a number of organizations, the amalgamation of which forms the Deutsches Haus (founded in 1927). The material in this collection should be considered a complement to the larger Deutsches Haus Collection (EL1. 1984). Deutsches Haus Charter and Legal Records, 1927–1975. 84-12-L. Correspondence, legal documents, deeds, and records of the organization, compiled by Leon S. Cahn, lawyer for the Deutsches Haus. New Orleans Invitation and Ticket Collection, c.1874–c. 1900. 78-28-L.2. 116 items. An artificial collection of tickets and invitations to various fundraising activities, picnics, and balls. These events were hosted by the German Men's Benevolent Society, the Girls of St. Mary’s School, the Orphans at St. Mary’s Hall, the Charm Social Club, the Germania Lodge No. 39, and other organizations. J. Hanno Deiler Papers, 1849–1909. MSS 395. 118 items. These papers are the basis for the work of John Hanno Deiler. They contain genealogies of prominent Louisiana German families, as well as draft and final versions of Deiler’s writings concerning Germans in the Southeastern United States. German Protestant Orphan Asylum Association Records, 1870–1957. MSS 402. 14 boxes. Records of the German Protestant Orphan Asylum, including minutes, Ladies Aid Society Treasurer’s books and reports, minute books, correspondence, and case records. Meysenbug-DeBuys Papers, 1917–1919. 87-5-L. 76 items. Correspondence file on the Von Meysenbug case and on the DeBuys family of N.O. The letters describe the attempts by Mrs. Von Meysenbug’s son-in-law to get her passage to America after war broke out in Europe. Ernest Von Meysenbug had been German consul in N.O. Meysenbug-Lyons Family Papers, 1859–1983. 87-5-L. 502 items. Includes scrapbooks, autograph books, biographies, carnival programs, correspondence, photographs, clippings, and sheet music. Microfilm of the First Evangelical Church Records. 84-27-L. 18 reels. Includes material from other German churches that various pastors brought with them to First Evangelical, as well as three reels of materials from the Second German Presbyterian Church. Much material is duplicated in the German Protestant Church Records Project (2000-43-l.1-3). 1834–1960. Microfilm of the Claiborne Avenue Presbyterian Church Records. 85-27-L. 3 reels. Includes the records of the Second German Presbyterian Church, (1863–1955). German Protestant Church Records Project, microfilm. 2000-43-L.1-3. 30 reels. Partially underwritten by the National Park Service. Records of First Trinity Evangelical United Church of Christ (originally called First German Protestant Church and Congregation of New Orleans, founded 1826), Jackson Avenue Evangelical Church (originally called German Evangelical Church and Congregation in Lafayette, founded 1846), and Zion Lutheran Church (originally called German Evangelical Lutheran Zion Church, founded 1848). Faust Family Papers. MSS 479. 41 items. The Faust Family Collection contains 41 items from 1848 to 1923 concerning the lives of this family of German immigrants, through photographs, citizenship papers, birth certificates, bills of sale, and a journal of French songs. Among the Faust family correspondents were William F. Johnson, George Welsman, and the City Engineer's Office of New Orleans. Arrangement: chronological. Three images along the Mississippi River. Illustration, print from wood engraving. Alfred R. Waud (Delineator) 1828–1891. Richardson, Russell (Engraver). Kilburn, Samuel S., Jr. (Engraver). (i) “Stake Island,” showing island which was a mud lump used as a cemetery by people on the Passes; (ii) “Southwest Pass Lighthouse,” in night scene with stars and moon; (iii) “Nun Danket Alle Gott,” showing German man playing the accordion supposedly aboard the steamboat The Great Eastern. June 3, 1871. Acc. No. 1953.94 i-iii. The Volksfest, or German May Festival, at New Orleans. May 26, 1859. Anonymous illustration (wood engraving). View of the German May Festival in a park; there are flags, tents, and bandstands; many people in clothing and dress of the day are standing about, listening to a band, seated at tables; there are several men on horseback. Acc. No. 1955.22.1 THNOC holds additional copies of this print, under the accession numbers 1955.22.2, 1974.25.2.204, and 1974.25.2.205. Canton on the Miss. Pencil and Chinese white drawing. Alfred R. Waud (Draftsman) 1828–1891. Street scene of Canton, Mississippi, showing college and German guesthouse (sign along facade reads “Deutsches Gasthaus”). C. 1871. Acc. No. 1965.68. Circle Window—St. Mary’s Assumption Catholic Church, Constance Street near Jackson Ave. Platinum photoprint. Morgan Whitney (photographer). Between 1880 and 1910. Acc. No. 1970.15.70. German Flower Women. Anonymous illustration (print from wood engraving). 1887. Acc. No. 1974.25.20.132. “Unsern Freund an den Ufern des Mississippi. 23. Sep 1853 (To our Friend, on the banks of the Mississippi).” Anonymous watercolor of a broken columnar monument, inscribed in German. Dated 1853. Acc. No. 1974.25.24.104. German emigrants. Anonymous photograph of illustration. Between 1950 and 1973. Original wood engraving by Jacob A. Dallas Acc. No. 1974.25.25.26. Photo of monument to 9th Ward WWI soldiers. Many of the names on the monument are German. Acc. No. 1974.25.24.153; 1994.138.19. Unidentified man at Wiesbaden, Germany. Anonymous photograph. N.d. Acc. No. 1974.25.25.92. German Evangelical Church; Central Police Quarters & Parish Prison [verso]. N.d. Illustration (magazine reproduction) by Cormier, Louis E. Acc. No. 1974.25.7.193. Christ Church Cathedral, St. Anna’s, St. Paul’s, and Coliseum Place Churches; Verso: Temple Sinai, Zion Church, German. N.d. Anonymous illustration (newspaper reproduction). Acc. No. 1974.25.7.218. German-Americans in New Orleans [57 portraits]. August 31, 1902. Poster showing faces of prominent German-Americans in New Orleans. Acc. No. 1974.25.27.514 a,b; 2002.92. “Germany's Contribution to Pres. Population of N.O.” Anonymous photograph of title page of J. Hanno Deiler’s 1886 monograph. Taken between 1950 and 1973. Acc. No. 1974.25.28.84. Cover of book from “Protestantischen Waisenhauses” (German Protestant Orphan Asylum). N.d. Anonymous photograph of cover of book from November 1888. Acc. No. 1974.25.28.93. St. Joseph’s German Orphan Asylum Cemetery Certificate. Vintage photograph by Charles L. Franck Photographers. 1950s. Acc. No. 1979.89.7270. German Heritage Festival Association/ Deutsches Haus. Poster celebrating the sixtieth anniversary of the founding of the Deutsches Haus and the Oktoberfest Parade. 1988. Photolithograph by Raymond N. Calvert (designer), C. Willem Printers, Inc. (printer). Acc. No. 1994.141.2. German Heritage Festival Association honors J. Hanno Deiler. Poster celebrating the Oktoberfest Parade, with a sketch showing an oval, bust-length portrait of a man flanked on either side by an American flag and a German flag and surmounted by an eagle. 1989.Photolithograph by Raymond N. Calvert (Designer). Acc. No. 1994.141.3. Saint Alphonse [sic] Church Constance Street, Corner of Josephine. Stereograph photograph by Blessing, Samuel T. View of the corner of Constance and Josephine Street in the Lower Garden District with St. Alphonsus Irish Church (built 1855–57) at 2029 Constance Street. Visible in the background are 2051–2053 Constance, the school of St. Mary’s Assumption German Church and a large number of school children standing in the intersection. The street is unpaved, with wooden planks over the gutters. Between 1865 and 1872. Acc. No. 1995.26.2 i,ii. United Fund, Dr. Rowland, Pierre the Pelican. Photograph by Roy Trahan, showing a view of an old man standing on a downtown rooftop. He wears a business suit and stands before a row of international flags, and he holds the corners of the German flag, bringing it into clear view. Before him is a sign with the cartoon image of a pelican dressed in a dinner jacket and holding a top hat. In the background, a billboard for Early Times Whiskey is visible in the shape of a bottle. September 1965. Acc. No. 1990.16.1.410. Tower, St. Mary’s Assumption Church. Photograph by Guy F. Bernard. View of the German Baroque–styled church at 2052 Constance (and Josephine Streets.) Visible is its three-stage bell tower. Architectural details include advancing and receding elements and varied patterns, decorative brickwork, applied arches, and a square tower that converts to an octagon, diminishing upward to terminate with a metal covered dome. December, 1961. Acc. No. 2000.46.3.15. Cypress Grove Cemetery. Photograph by Guy F. Bernard. Close-up view of an inscription tablet with inscriptions written in German. February 1957. Acc. No. 2000.46.2.621. Cypress Grove, John Saltzmann, 1888. Photograph by Guy F. Bernard. Close-up view of an inscription tablet for a German man and wife. The inscription includes “Milneburg Steam Fire Co. No. 1.” November 1956. Acc. No. 2000.46.2.629. Cypress Grove, Daniel Gerber, 1848. Photograph by Guy F. Bernard. Close-up view of an inscription tablet written in German. December 1959. Acc. No. 2000.46.2.630. Peter Gottschalk, Died 1846, Girod Street. Photograph by Guy F. Bernard. View of an inscription tablet and the number 218 seen above it. The inscription is for German native Peter Gottschalk and Charles Nathan. February 1957. Acc. No. 2000.46.2.761. Green Street Cemetery, Traugott Lehmann. Photograph by Guy F. Bernard. View of a headstone that includes the names of Sophia, Henry, and Traugott Lehmann, a native of Germany. The top of the stone has decorative carving around the edges and also shows the figure of a lady by a tomb under a weeping willow tree. October 1959. Acc. No. 2000.46.2.894. Green Street Cemetery, Peter Muller, 1862. Photograph by Guy F. Bernard. View of an inscription tablet with an inscription written in German. A small carving of a weeping willow tree can be seen at the top. October 1959. Acc. No. 2000.46.2.895. Green Street Cemetery, Mausoleum, Deutsche Freundschaftsbund, Gegrundt 1850. Photograph by Guy F. Bernard. View of a society tomb or mausoleum for Germans. Most of the vaults are open, and weeds grow around the base and from the open vaults. Acc. No. 2000.46.2.896. Greenwood Cemetery. Close-up view of a carving of two men shaking hands. Photograph by Guy F. Bernard. The carving is surrounded by the words “Deutscher Louisiana Draymen Verein,” a society tomb for the German draymen of the state. December 1956. Acc. No. 2000.46.2.908. Jacob Fischer, Lafayette Cemetery No.1. Photograph by Guy F. Bernard. View of a headstone with an inscription written in German. A carving of a lamb resting under two weeping willow trees is visible at the top of the stone, which appears to be crowded by other tombs. N.d. Acc. No. 2000.46.2.938. Lafayette Cemetery No. 1, Slab, Schoeff, 1846. Photograph by Guy F. Bernard. View of an inscription tablet that includes the names Maria Schoeff, Louisia Schoeff, Christian Jaquillard and Maria Elizabeth Acker. The inscription is written in German. February 1957. Acc. No. 2000.46.2.942. Lafayette Cemetery No. 1, Klein, 1851. Photograph by Guy F. Bernard. Close-up view of an inscription tablet for Catherine Klein, wife of Adam Ploth. An inscription written in German is visible below her name and date and also includes a carving of an angel carrying two children. September 1947. Acc. No. 2000.46.2.952. Lafayette Cemetery No. 1, Pediment: John Scheu, 1868. Photograph by Guy F. Bernard. View of the top half of the family tomb of John Scheu. Most of the inscription that is visible is written in German. A stature of a lamb resting is on the top of the pediment. The names George, Jacob, and Johann Scheu can be seen. March 1957. Acc. No. 2000.46.2.960. Lafayette Cemetery No. 2. View of a mausoleum for the Deutscher Handwerker Verien, a German society tomb dedicated in 1868. Photograph by Guy F. Bernard. Names on vault markers can be seen, and vases for flowers stand empty. November 1956. Acc. No. 2000.46.2.988. Lafayette Cemetery No. 2. View of a mausoleum for the Deutscher Handwerker Verien, a German society tomb dedicated in 1868. Photograph by Guy F. Bernard. Vault markers are missing from some vaults, and on others the inscriptions can be seen. A wooden trash barrel can be seen and part of another mausoleum is visible in the background. February 2, 1946. Acc. No. 2000.46.2.989. St. Joseph Cemetery, Peter Desimer, 1853. Photograph by Guy F. Bernard. View of a headstone for Peter Desimer, which is written in German. A carving of a cross on the same stone can be seen and two other stones showing the names Schwartz, Walther, and Ludwing can be seen. N.d. Acc. No. 2000.46.2.1082; 2000.46.2.1083. St. Joseph Cemetery No. 1, Agnes Spather 1889. Photograph by Guy F. Bernard. View of a weathered cypress headstone with a carved inscription that is written in German. March 1958. Acc. No. 2000.46.2.1092. St. Joseph Cemetery Gate, Tomb of a German Society. Photograph by Guy F. Bernard. View of an iron gate and gothic-style posts in front of a mausoleum. N.d. Acc. No. 2000.46.2.1093. German New Orleans: Highlighting German Heritage. Documentary video focusing on Germans in New Orleans from 1848–1980. Gift of WYES-TV. Acc. No. 2004.0250.